This New Year, Fireballs appeals to the explorer/adventurer within you. Make nature your companion and you will find yourself pushing the limits of indulgence. Have your cake, eat it too and wash it down with a fine drink and dine session. Indoor or Outdoor, your time with Fireballs will be a treat for the senses. At New Year’s party, let nature be your host. Celebrate this festive season in the lap of nature. New Year's Eve Bash 2015! 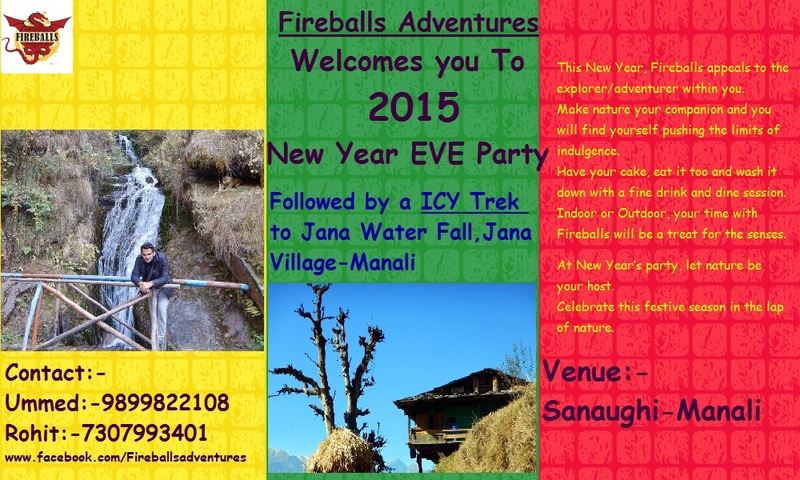 After check out, we will leave for our first trek of 2015 to Jana waterfall. We will start our trek from Sanaoughi which is of 2KM icy trek. After reaching waterfall we will enjoy the view, click sweet memories in our heart and camera then have some snacks, and start our back journey. Boarding Time:-8 pm on 30th Dec 2014. Deboading Place and Time:- 1st jan 2015 midnight Connaught Place. Pack your bags and head to Manali-Himachal, the charming retreat perched high amidst the heart of Manali-Sanaougi.